DANZA RAMA is back November 17th!! For those who missed out last year, our first Danza Rama was a HUGE sellout. People love the “formal” Gala/Cabaret Ball format with activities and entertainment for our social dancing/Salsa crowd and our awesome Zumba fitness crew! This year’s programme is shaping up even better, as we learned a lot from our first function about creating the type of event that Danza Loca students will continue to enjoy and demand! Danza Rama is still a cabaret, with professional and amateur dance performances and some friendly competitions, though this year we’ve simplified the programme to focus on more social dancing and party time with our DJ’s and percussion crew. We’ll be dining from a sensational gourmet buffet and carvery from new sponsors, WA Spit Roast. Ticket price still includes Champagne on arrival and some table wines. Buy a ticket from our online store or why not book a table through head office? Bring your friends and join the party! You can also enter our friendly social dance competitions on the night, and even be a part of the show! The competition structure this year focusses on maximum fun for social dancers. Only 7 friendly competitions are planned for Danza Rama. 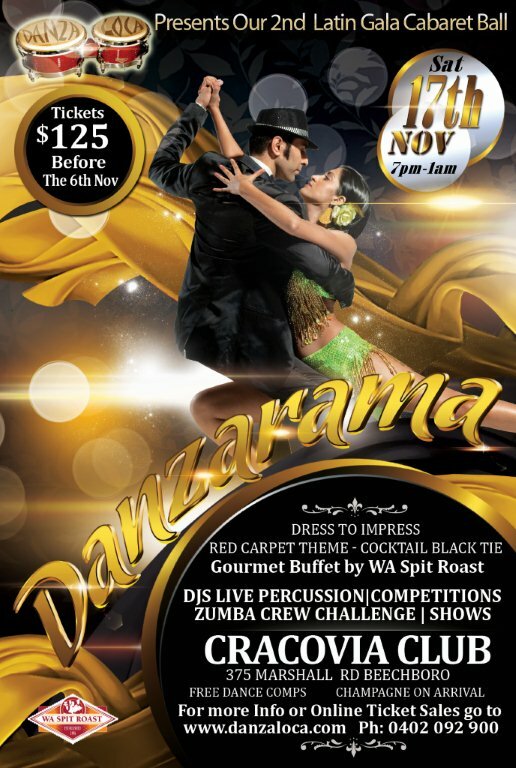 If you wish to participate in any of the competitions at Danza Rama you must REGISTER ON THE NIGHT (simple entry forms will be available on tables, to be completed and submitted to the Registrar. Male competitors will need to collect a number which must be worn while competing). There are NO FEES for entering the competitions. Adjudicators will be judging partnering skills, timing and Latin style. 7)	Rueda Triples (teams of 3 couples each, calling their own Ruedas!). Pros ok! WIN 3 MONTHS of FREE ZUMBA® CLASSES for YOU and YOUR CREW!! !